Due to their great size, strength and intelligence, elephants are challenging animals to care for in zoos and wildlife preserves. In fact, medical diagnostic methods utilized by veterinarians on smaller animals are not easily adapted to elephants. Ultrasonography – the use of sound waves to view internal anatomy – is a non-invasive method to explore reproductive anatomic structures. In 2001, ultrasound workshops sponsored by IEF were held in two locations in southern India to teach local elephant caregivers how to perform this diagnostic test. 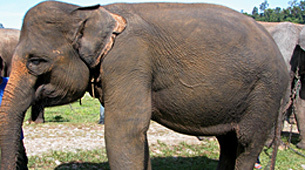 In 2003, IEF funded hands-on ultrasound workshops for wildlife scientists in two locations in India to continue the exchange of information between scientists working with wild and captive elephants in range states and the technology developed by Western scientists working with captive elephants in the Northern Hemisphere. In 2004 the Project Investigators provided hands-on training of ultrasound technology using male and female elephants, and presented information about medical cases enhanced by the use of this new technology. Additionally, the ultrasound equipment was donated to the Indian veterinarians to continue their assessment of captive and wild elephants in the field, as well as transfer this knowledge to other scientists in Asia. By sharing this kind of technology, the elephants in India will contribute greatly to the ongoing study of elephant populations in range states.